The second playoff game between the San Jose Sharks and Vegas Golden Knights was a beauty. It was played at a high level, with chippiness thrown in for good measure. The lead went back and forth, with great plays and lucky bounces both playing a role in the outcome. Unlike Game 1, a blowout win dominated start to finish by Vegas, Game 2 was a thrill ride pretty much from the opening puck drop. The Golden Knights jumped out to a 2-0 lead, making it nine straight goals they scored to open the series. Both goals came from Vegas scoring leader William Karlsson, the first goal coming with just two minutes left in the first period during 4-on-4 play. Karlsson’s second came less than a half minute into the period two. If the Sharks were feeling snake-bitten, well, they had reason. They’d had the better of the play, but without the result that matters. 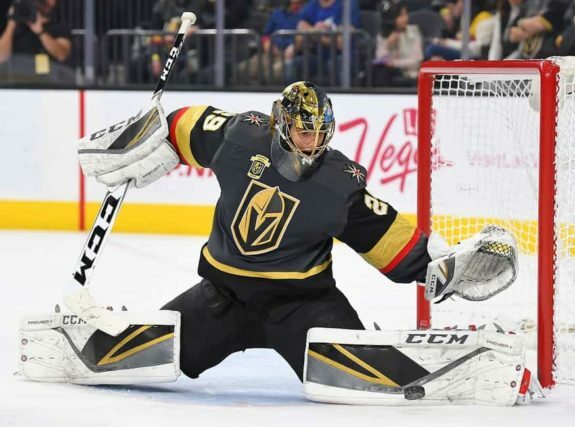 Once again, Vegas goaltender Marc-Andre Fleury stood strong, yet to allow a goal through four periods of hockey against the Sharks. But, as the second period continued, the Sharks fought back, scoring not once, but three times. A Sharks power play got them on the scoreboard for the first time in the series. It was a Brent Burns shot which deflected off Vegas forward Pierre-Edouard Bellemare on its way to the net. Logan Couture sniped the Sharks second goal during 4-on-4 play, benefitting from strong play behind the net by Tomas Hertl. A Brent Burns wraparound, another 4-on-4 goal, put the Sharks ahead for the first time in the series. The play was reviewed for goaltender interference, but it was clear a Vegas player pushed a Sharks player into Fleury and the goal stood. Vegas fought back in the final period, as their intensity seemed to increase. A deep shot from Nate Schmidt, hit the skate of Melker Karlsson and got past Sharks goalie Martin Jones to tie the game. The teams went to overtime, the score tied at three apiece. Early in the overtime period, San Jose had excellent opportunities, including a Barclay Goodrow breakaway, but Fleury was up to the task and the momentum began to shift. By the midpoint of the overtime period, Vegas had taken control of the play. Jones saved a James Neal shot off the shaft of his stick. Shortly thereafter, a Jonathan Marchessault shot beat Jones. However, a review indicated goaltender interference and the game continued. It remained deadlocked after the first overtime. In the second overtime, the Sharks drew a pair of early power plays. The first went for naught, the second proved conclusive. A cross-ice feed from Kevin Labanc to Couture resulted in the second goal of the game for the Sharks sniper, and the goal which gave the Sharks a 4-3 win. Part of the Sharks challenge with lengthy overtimes in games played at a high tempo, players tend to wear down. For the Sharks, three players took a notable dip in playing time during regulation. Sharks head coach Peter DeBoer essentially stopped using defenseman Paul Martin early in the third period — he played just ten minutes total. This left the Sharks rotating defensive combinations among five defenders, both wearing them down and using combination which were less familiar with each other. Marcus Sorensen and Joonas Donskoi also saw their ice time dry up along the way. The shortened bench seemed to aid Vegas in the latter half of the first overtime. 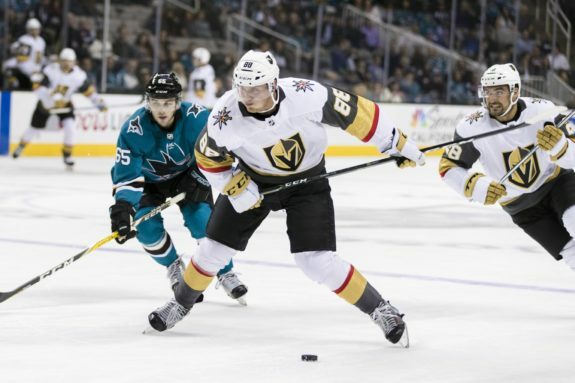 Fortunately for the Sharks, they ended the game just over five minutes into the second overtime, not risking a repeat of Vegas’ dominant play in extra time. The Sharks took important lessons to heart. Moving the puck behind the net is the best way for San Jose’s offense to neutralize the aggressive Vegas defense. Both Sharks even strength goals resulted from play behind the net. Hertl went behind the net on the Sharks first even-strength goal before feeding the puck to Couture; Burns went behind the net and scored the second himself. In our piece following Game 1, we mentioned both Burns and Hertl taking the puck down low and the Sharks using their strong forwards powering to the net as counter measures to the Vegas defense. Several penalties came on possessions where the Sharks operated behind the net, including the penalty which led to the game winner. Power forwards played an enormous role for San Jose. Hertl had a superb game, as did Timo Meier, whose drive to the net resulted in the penalty which led to the winning power play. 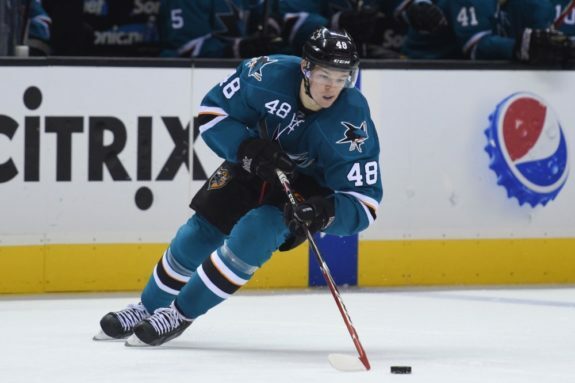 The Sharks formula, featuring Burns, Hertl and Meier, doing what they excel at, led to the win. The Sharks were the better team, but both teams had chances to win the game. The best indicator of who dictated play was the number of power play opportunities. San Jose had seven opportunities to just two for Vegas. We noted above three goals coming during 4-on-4 play. In total, officials called concurrent minors four times during the game. Fleury was still the better netminder. Jones still wasn’t as sharp as he was in the opening round series against the Anaheim Ducks, but more action gives him more time to settle in and find his game. As the series goes along, I expect Jones to improve. The long layoff didn’t help him, but after a bit over five periods of play (he was pulled early in period two of Game 1), he should be close to form. Ultimately, the Sharks needed a bit of puck luck to collect the victory, but in a tough series, puck luck is part of the equation. The Sharks outshot Vegas 47-29. The statistic overstates the difference (in part due to power play differential), but the edge was definitely to San Jose. After the opening game loss to Vegas, an epic blowout, the Sharks looked squarely into the eyes of an even more painful loss. And in double overtime, they pulled out the victory. 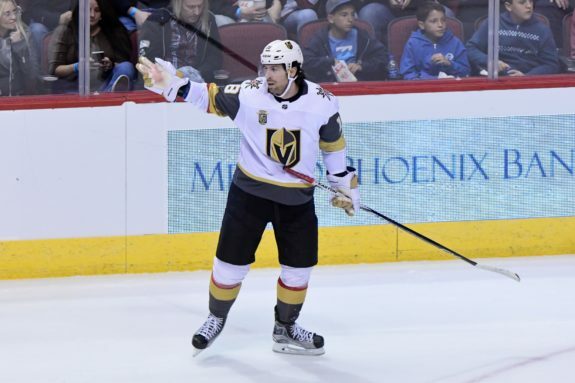 While the Sharks no doubt feel good about their game and their win, it is only one win, just as the dominant Vegas performance in Game 1 resulted in only one win for Vegas. But it is Vegas who’ll need to regroup after a painful loss. Still, if the series resembles Game 2 the rest of the way, it’ll be a treat for hockey fans – and nail-biting time for the fans of the two teams. 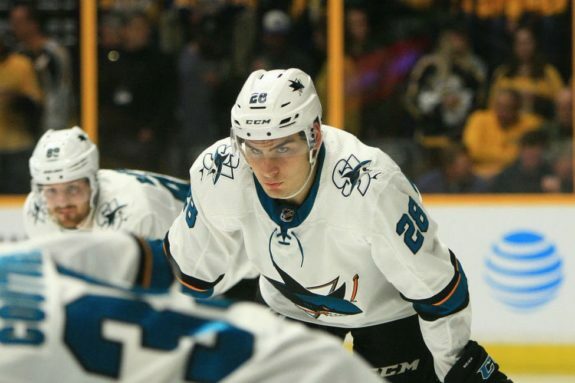 • The only Sharks player who was a ‘plus player’ in Game 2 was defenseman Dylan DeMelo. DeMelo played a modest 17 minutes, leaving the remaining four defensemen to play a lot. Marc-Edouard Vlasic led San Jose with 37 minutes of ice time, while Burns, Justin Braun and forward Joe Pavelski (who was terrific) all topped 30. Only Schmidt topped 30 minutes for Vegas, and only by half a minute. While this much ice time can be an issue for future games, several things mitigate in this specific case. The long break between series helps, since the Sharks have only played twice in ten days. Also, Game 1 didn’t require the Sharks to play intense hockey, as they were out of the game for much of it. And Evander Kane, one of the Sharks major ice time forwards, was suspended for Game 2. He’ll obviously be fresh for Game 3. • In the absence of Kane, forward Marcus Sorensen started the game on the third line, with Goodrow stepping into Sorensen’s spot on the fourth line. This was the first time DeBoer did major in-game line juggling in the playoffs. Most notably, Mikkel Boedker spent time on the line with Pavelski and Meier. 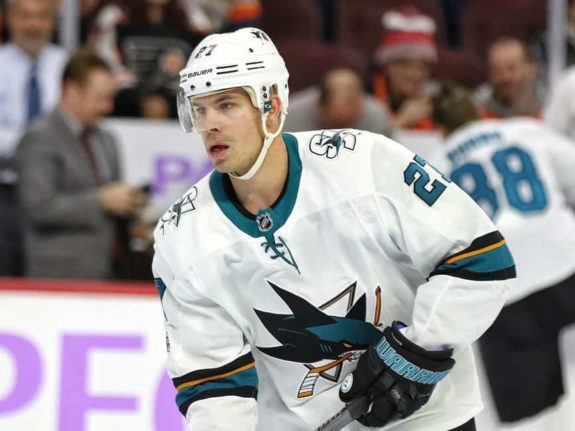 Donskoi, who started on the Pavelski line, dropped to the third line before largely dropping off the radar screen. • William Carrier is the Vegas player who gets the least ice time, but he makes the most of it. In eight minutes in Game 2, he had eight hits. Marchessault led both teams in hits with nine. • The Sharks have yet to score a 5-on-5 goal in the two games. After being shutout in Game 1, they scored twice during 4-on-4 play and twice on the power play. • Some will say San Jose now has home ice advantage in the series, but I don’t consider home ice much of an advantage. History, for what it’s worth, agrees.